Bormioli Rocco Presents You With The Bodega Collection Glassware Set! The Bodega glasses are 17 ounces large and they have a sleek, minimalist design, a smooth rim and a thick sturdy base. These drinking glasses come in a set of 12, and they are suitable for bar, pub, restaurant, café store and home use. You can use these drinking tumblers to enjoy many different kinds of drinks or food, including: Water, Beer, Juice, Fresh Lemonade, Refreshments, Wine, Whiskey, and Cocktails. Drinking Glasses That Are Built To Last! These 17oz glass tumblers are made in Spain with premium quality tempered glass and excellent craftsmanship. The tempered glass ensures that this maxi size tumbler has high resistance to thermal shock, breakage, chipping and dishwasher wear. Even if you use and wash the glass tumblers daily, they will always be crystal clear and as good as new! Get A Glass Set For Yourself Or For A Friend! The Bodega drinking glasses will definitely come in handy at home or at your business, so get your very own set today! Alternatively, get a drink glass set for a friend or family member as a birthday, wedding or housewarming gift! Don’t waste another minute! Place an order while our supplies last! Scroll Up And Click “Add to Cart” NOW! GET THE BORMIOLI ROCCO BODEGA COLLECTION: This 12-piece drink tumbler set is the Bodega Collection by Bormioli Rocco, and it's here to add a touch of elegance to your glassware collection and dining table! These drink glasses have a 17-ounce capacity and a thick, sturdy base. USE THESE GLASSES FOR ALL KINDS OF DRINKS: You can use these tumbler glasses to enjoy many different kinds of drinks or beer. Whether you want to drink some water, beer, juice, refreshment, or a stylish, delicious cocktail, our 17 ounce tumblers will elevate your drinking or dining experience! 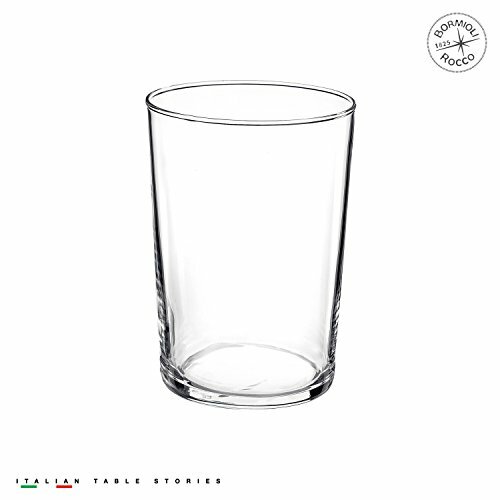 INCREDIBLY DURABLE MATERIAL: Bormioli Rocco's 17oz glasses are made of premium quality tempered glass. Thanks to this heavy-duty material, our modern cold drink tumblers are resistant to thermal shock, breakage, chipping and dishwasher wear. THESE TUMBLERS WILL ALWAYS BE CRYSTAL CLEAR: You can either hand wash these 17oz drinking glasses or put them in the dishwasher. Even if you use and wash the drinking tumblers daily, their crystal clear tempered glass will not get cloudy and lose its luxurious finish. FOR BARS, RESTAURANTS AND HOME USE: This 12-piece drinking glass set can be used by bar, pub and restaurant owners. You can also use these stylish maxi-sized glasses at home during family dinners, or when you host parties. Regardless, the maxi glasses will look amazing! If you have any questions about this product by Bormioli Rocco, contact us by completing and submitting the form below. If you are looking for a specif part number, please include it with your message.